Webster University’s Leigh Gerdine College of Fine Arts Department of Dance presents "Temporary Beings." The concert showcases original choreography of senior BFA candidates Stephanie Borcherding, Alyssa Perez, Josiah Gundersen, and Rachel Tegtmeier. 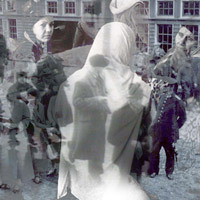 "Temporary Beings" runs Nov 8-9 at 7:30 p.m., as well as Nov. 10 at 2 p.m. The concert is free and open to the public, however, donations are accepted. 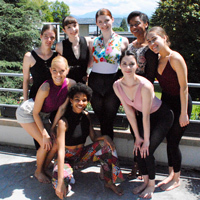 Webster University Department of Dance students are enjoying an eight-week summer course at the Webster Geneva campus with classes from Webster alumnus Ramon Moraes and fellow Royal Ballet School alumna Estelle Bovay. This new study abroad program for dance is a partnership between the Department of Dance, Webster Geneva, and Conservatoire populaire de musique, danse et théâtre in Geneva. 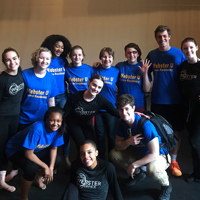 The Webster University Dance Residency annually places students as mentors in mini-residency at local high schools, with support from private donors. This year they worked with Webster Groves High School and its Theatre Program, integrating dance into the curriculum. One Dance Fellow pursuing a degree in special education at Webster was able to add to the special needs aspect of the 2018 residency. The Webster University Leigh Gerdine College of Fine Arts Department of Dance presents the Webster University Dance Ensemble 2018 (WUDE), under the artistic direction of Beckah Reed. With choreography from international artist Cleo Parker Robinson, alumna Eve Mason and faculty emeritus Gary Hubler, come experience the beauty and uplifting attributes of dance, its rhythms, power of community and also explore some of the challenges of humanity in 2018. The Leigh Gerdine College of Fine Arts Department of Dance presents the Webster University Dance Ensemble 2017 (WUDE), under the artistic direction of Beckah Reed. This year’s concert, April 28-30, shares contemporary choreography from international artist Nejla Yatkin; environmental performer and alumna Heather Sultz, and a collaboration with the dancers of Big Muddy Dance Company, with choreographer Thom Dancy. Heather Sultz '86, 2017 Guest Alumni Choreographer for the Dance Department, will be in residence in February to set a new dance piece on the Webster University Dance Ensemble, for performance this spring. In addition, she will hold workshops and lectures for both the Dance Department and the Biological Sciences Department. Students and faculty in the Department of Dance attended, presented, and impressed with their performances at the Central Region American College Dance Association (ACDA) Conference at Anderson University in Indiana. Thirty other colleges and universities from across the region joined them for daily dance technique classes, discussions and presentations, and performances followed by feedback sessions. 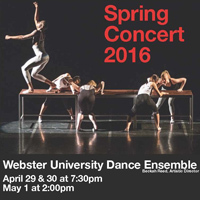 The Webster University Dance Ensemble annual spring concert will feature student performances under the artistic direction of Beckah Reed with further guidance by Roxane d'Orelans-Juste, faculty emeritus Gary Hubler, alumni choreographer Maggi Dueker and more. This diverse performance April 29-May 1 will include works from Jose Limon, West African dance, ballet and contemporary among others. Webster Geneva Psychology and Counseling head Ros Thomas' new book, "Psychological Stress - Aid Workers in Complex Humanitarian Emergencies," explores the impact on humanitarian workers of their proximity to violence, James Robey's "Beginning Jazz Dance" includes photos and video clips to teach techniques and core jazz dance concepts, and Van McElwee's outdoor video, "Wandrung" (Migration), was commissioned by the German Consul General of Boston. School of Communications professor Don Corrigan has been heavily engaged in coverage and awareness of the radioactive West Lake Landfill issue. Lionel Cuille recently co-presented 'Exploring Dance through Poetry" with Dawn Karlovsky of Karlovsky and Company modern dance. Webster University’s Office of Study Abroad announces Shannon Haubrich has been selected as a Benjamin A. Gilman International Scholarship recipient for Summer 2015.